Most often, mineral oil is a liquid by-product of refining crude oil to make gasoline and other petroleum products. This type of mineral oil is a transparent, colorless oil, composed mainly of alkanes and cycloalkanes, related to petroleum jelly. It has a density of around 0.8 g/cm3. Some of the imprecision in the definition of the names (e.g., "mineral oil", "white oil") reflects usage by buyers and sellers who did not know, and usually did not need to care about, the precise chemical makeup. Merriam-Webster states the first use of the term “mineral oil” was 1771. Prior to the late 19th century, the chemical science to determine such makeup was unavailable in any case. A similar lexical situation occurred with the term "white metal". In lubricating oils, mineral oil is termed from groups 1 to 2 worldwide and group 3 in certain regions. This is because the high end of group 3 mineral lubricating oils are so pure that they exhibit properties similar to polyalphaolefin - PAO oils (group 4 synthetics). The World Health Organization classifies untreated or mildly treated mineral oils as Group 1 carcinogens to humans; highly refined oils are classified as Group 3, meaning they are not suspected to be carcinogenic but available information is not sufficient to classify them as harmless. The UK Food Standards Agency (FSA) carried out a risk assessment on the findings of a survey made in 2011 on risks due to migration of components from printing inks used on carton-board packaging, including mineral oils, into food. The FSA did not identify any specific food safety concerns due to inks. People can be exposed to mineral oil mist in the workplace by breathing it in, skin contact, or eye contact. In the United States, the Occupational Safety and Health Administration has set the legal limit for mineral oil mist exposure in the workplace as 5 mg/m3 over an 8-hour workday. The National Institute for Occupational Safety and Health has set a recommended exposure limit of 5 mg/m3 over an 8-hour workday and 10 mg/m3 short-term exposure. Levels of 2500 mg/m3 and higher are indicated as immediately dangerous to life and health. However, current toxicological data does not contain any evidence of irreversible health effects due to short term exposure at any level; the current value of 2500 mg/m3 is indicated as being arbitrary. Mineral oil is used as a laxative to alleviate constipation by retaining water in stool and the intestines. Although generally considered safe, as noted above, there is a concern of mist inhalation leading to serious health conditions such as pneumonia . Mineral oil can be administered either orally or as an enema. Also, it is sometimes used as a lubricant in enema preparations, because most of the ingested material is excreted in the stool rather than being absorbed by the body. Over the counter veterinarian use mineral oil is intended as a mild laxative for pets and livestock. Certain mineral oils are used in livestock vaccines, as an adjuvant to stimulate a cell-mediated immune response to the vaccinating agent. In the poultry industry, plain mineral oil can also be swabbed onto the feet of chickens infected with scaly mites on the shank, toes, and webs. Mineral oil suffocates these tiny parasites. In beekeeping, food grade mineral oil-saturated paper napkins placed in hives are used as a treatment for tracheal and other mites. It is also used along with a cotton swab to remove un-shed skin (ashes) on reptiles such as lizards and snakes. The type of highly refined and purified mineral oil found in cosmetic and skincare products is noncomedogenic (does not clog pores). Mineral oil is used in a variety of industrial/mechanical capacities as a non-conductive coolant or thermal fluid in electric components as it does not conduct electricity and functions to displace air and water. Some examples are in transformers, where it is known as transformer oil, and in high-voltage switchgear, where mineral oil is used as an insulator and as a coolant to disperse switching arcs. The dielectric constant of mineral oil ranges from 2.3 at 50 °C (122 °F) to 2.1 at 200 °C (392 °F). Mineral oil is used as a lubricant, a cutting fluid, and a jute batching oil. [clarification needed] Spindle oils are light mineral oils used as lubricants in textile industries. 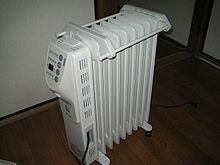 Electric space heaters sometimes use mineral oil as a heat transfer oil. Because it is noncompressible, mineral oil is used as a hydraulic fluid in hydraulic machinery and vehicles. An often cited limitation of mineral oil is that it is poorly biodegradable; in some applications, vegetable oils such as cottonseed oil or rapeseed oil may be used instead. Food grade mineral oil has an E number of E905a, although it has not been approved in food products in the European Union, and incidental amounts in foods are carefully regulated. [dubious – discuss] Because of its properties that prevent water absorption, combined with its lack of flavor and odor, food grade mineral oil is a popular preservative for wooden cutting boards, salad bowls, and utensils. Rubbing a small amount of mineral oil into a wooden kitchen item periodically, will impede absorption of food liquids, and thereby food odors, and ease cleaning. By impeding water absorption, wetting and drying cycles, which can cause cracks or splits in wood, are reduced although some of the mineral oil is picked up by the food and ingested. Outside of the European Union, it is occasionally used in the food industry, particularly for confectionery. In this application, it is typically used for the glossy effect it produces, and to prevent the candy pieces from adhering to each other. It has been discouraged for use in children's foods, though it is still found in many confectioneries, including Swedish Fish. The use of food grade mineral oil is self-limiting because of its laxative effect. The maximum daily intake is calculated to be about 100 mg, of which some 80 mg are contributed from its use on machines in the baking industry. Mineral oil's ubiquity has led to its use in some niche applications as well. It is used for treating and preserving wooden butcher block counter tops. It is recommended by the American Society for Reproductive Medicine for use as a fertility-preserving vaginal lubrication. The degrading effect of oils on latex condoms should be borne in mind. Mineral oil is commonly used to create a "wear" effect on new clay poker chips, which can otherwise be accomplished only through prolonged use. Either the chips are placed in mineral oil (and left there for a short period of time) or the oil is applied to each chip individually, then the chip is rubbed clean. This removes any chalky residue left over from manufacture, and also improves the look and "feel" of the chips. It is used as the principal fuel in some types of gel-type scented candles. It is used for cooling, for example liquid submersion cooling of components in some custom-built computers. Veterinarian-grade mineral oil is an inexpensive source for mineral oil and is frequently used by amateur radio operators as coolant in RF dummy loads. Mineral oil is typically used as the insulating and cooling fluid in large electrical equipment such as transformers. It is used as a transparent collision material for reactions in particle physics, as in the MiniBooNE neutrino oscillation experiment. As a relatively low heat combustible with no flavor or odor, mineral oil can be used in firebreathing and firedancing, but there is an inherent risk of injury. Paraffin oil is also commonly being used to fill Galileo thermometers. Due to paraffin oil's freezing temp being lower than water (approx. 24 °F or −4 °C), this makes them less susceptible to freezing during shipment or when temporarily being stored in a non-climate-controlled environment. ^ "Mechanical properties of materials". Kaye and Laby Tables of Physical and Chemical Constants. National Physical Laboratory. Archived from the original on 11 March 2008. Retrieved 6 March 2008. ^ "Definition of MINERAL OIL". www.merriam-webster.com. Retrieved 10 September 2018. ^ International Agency for Research on Cancer (17 June 2011). "Agents Classified by the IARC Monographs, Volumes 1–102" (PDF). Lyon, France: International Agency for Research on Cancer. pp. 3, 19. Archived (PDF) from the original on 25 October 2011. Retrieved 11 November 2011. ^ "Survey of printing inks and mineral oils". Food Standards Agency. London. 15 December 2011. Archived from the original on 15 May 2012. ^ "CDC - Immediately Dangerous to Life or Health Concentrations (IDLH): Oil mist (mineral) - NIOSH Publications and Products". www.cdc.gov. 16 November 2017. Retrieved 12 June 2018. ^ Weinstein, M. (2001). "First do no harm: The dangers of mineral oil". Paediatrics & Child Health. 6 (3): 129–131. doi:10.1093/pch/6.3.129. PMC 2804525. PMID 20084222. ^ "Mineral Oil". Drugs & Medications. WebMD. Retrieved 20 April 2019. ^ "Mineral Oil rectal enema". Health Library / Drugs, Devices & Supplements. Cleveland Clinic. Retrieved 20 April 2019. ^ Pasquini, Chris (1998). Guide to Equine Clinics (Volume 1). Sudz Publishing. p. 84. ISBN 978-0-9623114-6-8. ^ DiNardo, J. C. (2005). "Is mineral oil comedogenic?". Journal of Cosmetic Dermatology. 4 (1): 2–3. doi:10.1111/j.1473-2165.2005.00150.x. PMID 17134413. ^ "Transformer oil deterioration - Why is transformer oil purification essential?". ^ Suwarno Darma, I.S. ; Darma, I. S. (2008). "Dielectric Properties of Mixtures between Mineral Oil and Natural Ester". Proceedings of 2008 International Symposium on Electrical Insulating Materials: 514–517. doi:10.1109/ISEIM.2008.4664471. ISBN 978-4-88686-005-7. ^ Shkol'nikov, V. M.; L. A. Bronshtein; Yu. N. Shekhter; O. L. Drozdova (1977). "Electrical and viscosity properties of mineral oil components". Chemistry and Technology of Fuels and Oils. Springer New York. 13 (7): 479. doi:10.1007/BF00730107. ^ Oommen, T.V. (2002). "Vegetable Oils for Liquid-Filled Transformers". Electrical Insulation Magazine, IEEE. 18 (1): 6–11. doi:10.1109/57.981322. ^ "Mineral Oil Liquid Facts and Comparisons". Wolters Kluwer Health – A to Z Drugs Facts. Drugs.com. 3 June 2009. Archived from the original on 1 June 2009. Retrieved 13 July 2009. ^ Cadbury Adams USA, LLC (2010). "Swedish Fish Nutrition Facts". Archived from the original on 19 October 2012. ^ "Best Method for Treating a Butcher Block Counter Top". oldtownhome.com. 14 November 2012. Archived from the original on 2 April 2015. Retrieved 31 March 2015. ^ "Optimizing Natural Fertility" (PDF). Archived (PDF) from the original on 12 November 2013. Retrieved 11 November 2013. ^ Voeller, B; Coulson, A. H.; Bernstein, G. S.; Nakamura, R. M. (1989). "Mineral oil lubricants cause rapid deterioration of latex condoms". Contraception. 39 (1): 95–102. doi:10.1016/0010-7824(89)90018-8. PMID 2535978. ^ John Tucker. "Oiling Chips FAQ". Poker Chip Reviews. Archived from the original on 13 August 2009. Retrieved 13 July 2009. ^ "Economic Data on Candle and Incense Production and Sales" (PDF). Candles and Incense As Potential Sources of Indoor Air Pollution: Market Analysis And Literature Review. United States Environmental Protection Agency. January 2001. Archived (PDF) from the original on 2 June 2011. Retrieved 11 October 2010. Gel candles use liquids such as mineral oil, terpene-type chemicals, or modified hydrocarbons as their primary fuel. ^ John Bach (5 May 2007). "Mineral Oil Submerged Computer". Puget Custom Computers. Archived from the original on 7 July 2009. Retrieved 13 July 2009. ^ Patrick Norton; Roger Chang (9 March 2009). "How to Build an Oil-Cooled Aquarium PC". Revision3. Archived from the original on 15 July 2009. Retrieved 13 July 2009. ^ "Detector". MiniBooNE Experiment Details. Fermilab. Archived from the original on 10 December 2015. Retrieved 7 December 2015. ^ "Study Material for the Examination for Certificate of Fitness for Fire Producer E-28 Fire Performer E-29" (PDF). New York City Fire Department. December 2015. Archived (PDF) from the original on 27 September 2016. ^ Weinberg, I.; Fridlender, Z. G. (2010). "Exogenous lipoid pneumonia caused by paraffin in an amateur fire breather". Occupational Medicine. 60 (3): 234–5. doi:10.1093/occmed/kqq020. PMID 20308260. ^ Saraf, Sanjay (2012). "Fire-breathing burn". Indian Dermatology Online Journal. 3 (1): 73–4. doi:10.4103/2229-5178.93491. PMC 3481926. PMID 23130274. ^ "Galileo Thermometer Material Safety Data Sheet" (PDF). 13 November 2002. Archived (PDF) from the original on 16 June 2015. Retrieved 20 February 2017. 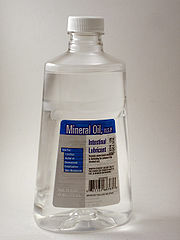 Wikimedia Commons has media related to Mineral oil.